Hulu is the first streaming service to win the Emmy award for outstanding drama series. Hulu made history when its original series "The Handmaid's Tale" won the Emmy award for outstanding drama series Sunday. It's the first time the Television Academy selected a television series from a streaming service in this category. It's one of the top awards handed out during the prime-time telecast. There was plenty of streaming competition in the drama series category this year — Netflix's "House of Cards," "Stranger Things" and "The Crown" were all nominated. While Netflix and Amazon are award show veterans at this point, Hulu's big win for "The Handmaid's Tale" is all the more impressive because Hulu is a relative Emmy newcomer. It earned two technical Emmy nominations in 2016. This year, the streaming service earned 18 nominations, with "The Handmaid's Tale" accounting for 13 of them. In the end, "The Handmaid's Tale" took home eight awards, including lead actress in a drama series and outstanding directing for a drama series. A streaming service still has yet to win the gold Emmy statue for TV's other top award: outstanding comedy series. 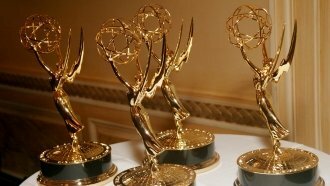 HBO's "Veep" nabbed the win Sunday for the third consecutive year.